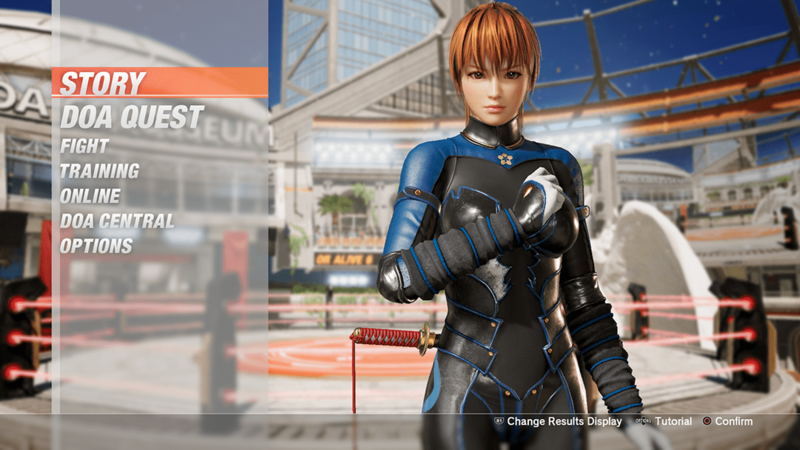 Explore the main story of DEAD OR ALIVE 6. Complete tasks (missions) to clear character quests. Rewards are awarded for successfully cleared missions. ARCADE Fight against a random selection of opponents to try to achieve the highest score. TIME ATTACK Fight against a specific number of opponents within a specified time limit. SURVIVAL Defeat as many opponents as you can, as they appear one after another. FREE TRAINING Freely practice various actions with each character. TUTORIAL Learn and practice action systems of the game. COMMAND TRAINING Practice button commands and actions with each character. COMBO CHALLENGE Practice character-specific moves and combos. RANKED MATCH Fight against other players of the same rank online. Use in-game currency to purchase various bonuses and cosmetic items. WARDROBE Unlock and purchase new costumes, hairstyles, accessories, and titles. Customize your main fighter. DATABASE View your fight records. THEATER Watch replays and COM vs. COM battles. MUSIC Unlock and purchase new BGM. Change BGM settings for various modes. LIBRARY Purchase and view DOA Encyclopedia and Trivia entries. GAME SETTINGS Adjust various game settings. SOUND Adjust various volume and voice settings.